[prMac.com] Lafayette, Oregon - REALbasic Developer Magazine's new March/April issue (7.3) is now available in print and PDF formats. As of March 2009, the full-color print edition ships internationally to Canada and the UK. 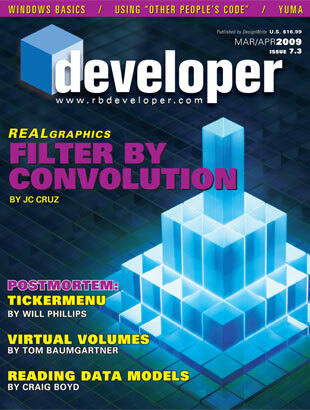 This issue features an in-depth article on creating Photoshop-like image filters for your REALbasic programs, a beginner's guide to using Virtual Volumes to store text and images in the same file, how to read data models, and a "postmortem" of the acclaimed TickerMenu software. Our columnists in this issue write about database reporting, windows basics, using Yuma, working with "other people's code," making graph paper, and as well as product reviews and news. Also available on the RBD website is a 300-page printed, perfect-bound book of Year Six of the magazine (issues 6.1-6.6). This book contains several issues that were never printed originally and are thus only available in print within this book for via MagCloud's printing service. For everyone who seeks the flexibility to create their own software, REAL Software provides REALbasic, a powerful, easy-to-use software development tool for Windows and Macintosh that creates software for Macintosh, Windows, and Linux. REAL Software, Inc. was founded in 1996 and is based in Austin, Texas. For more information visit their website or call 512.328.7325. Interested readers may purchase full-color print editions of REALbasic Developer via the MagCloud fulfillment service, which has just begun shipping magazines internationally to Canada and the UK (support for other countries is coming soon). Digital editions in PDF may be purchased directly from the RBD website. Individual issues are $10; annual subscriptions (six issues) are $50 (USD). Launched in the summer of 2002, REALbasic Developer is an independent bimonthly publication focused on instructing users of the REALbasic development environment. Each issue features over 50 pages of quality articles from top REALbasic programmers and authors. Copyright 2009 REALbasic Developer. All Rights Reserved. REALbasic, and the REALbasic logo are registered trademarks of REAL Software, Inc.